Out of all the afternoon tea places I have been to (about 30 to date), Four Seasons in Hong Kong offers by far the best food, the best presentation, the best service and the best overall experience. 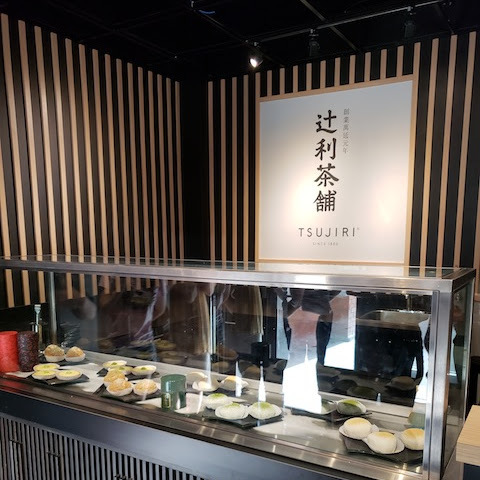 Reservations can only be made within 2 weeks of the planned visit and time slots fill up very quickly, so it's a good idea to call on the first day reservations open. Afternoon tea is served in The Lounge, just adjacent to the lobby. The ambiance is classic and traditional, not at all flashy like The Lounge at Ritz Carlton. 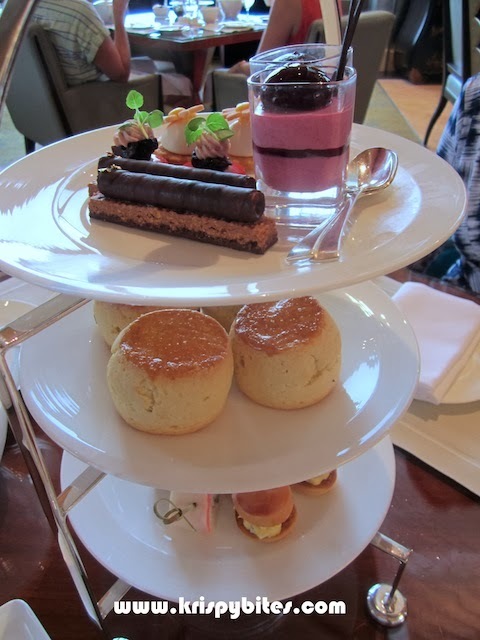 The menu featured a la carte desserts, but we opted for the set afternoon tea ($250 HKD ~ $34 CAD/person; $470 HKD ~ $63 CAD/couple). We chose from a selection of green, herbal, black, and white teas. 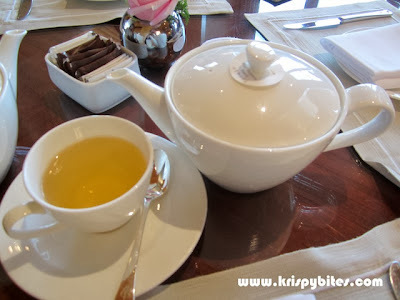 I initially got the Four Seasons Hotel Hong Kong Signature Blend, but felt it was too weak and lacked character, so I asked for Organic Lychee Green which was very fragrant and fruity. The food tower was like a work of art. I was really impressed with the presentation and detail in every piece. 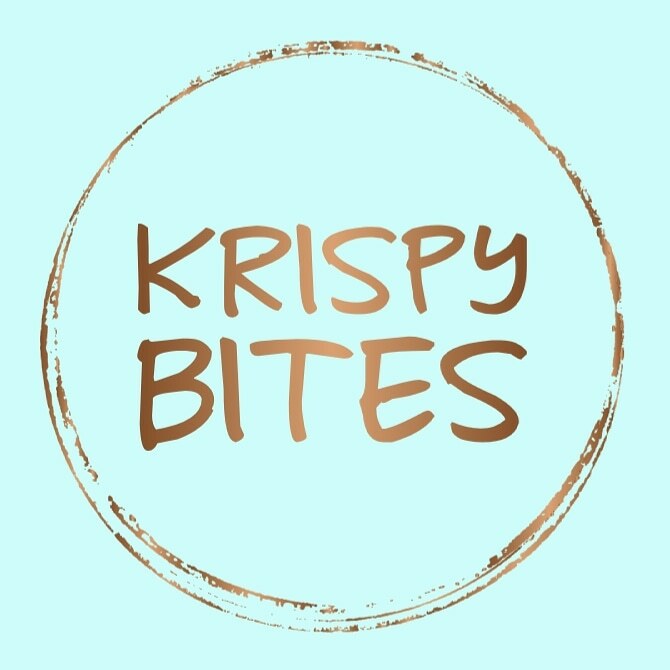 Another thing I loved was the surprise element; judging by appearances alone, there was no way of telling what ingredients were used and what tastes would be present in certain items before biting into them. There were several times I let out a muffled "Mmm?!?!" 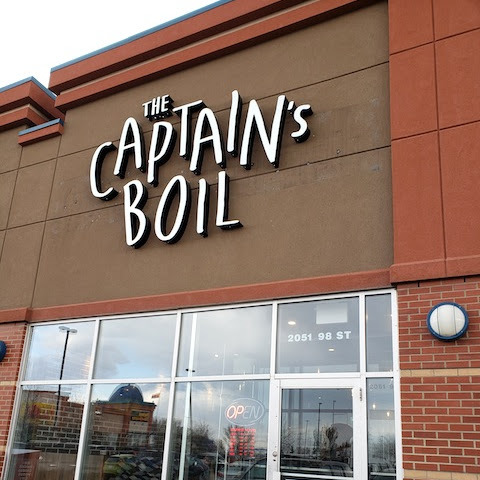 when unexpected flavours exploded in my mouth. Apart from the ham and cheese sandwich which was really plain and tasted like a school lunch, everything else was amazing. 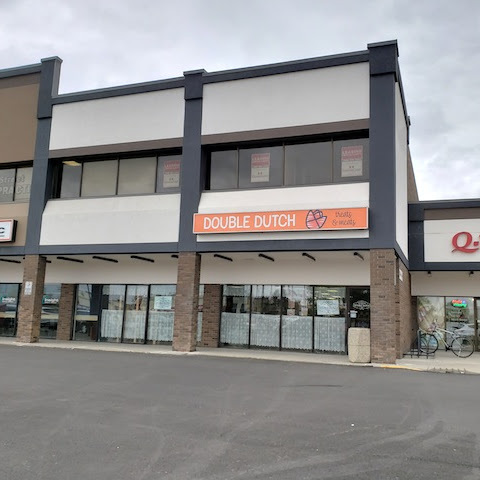 The squishy mini bun with truffled egg salad was cute, the prosciutto on quiche was solid, and even the plain-looking turkey wrap was surprisingly tasty. But my favourite of all was the profiterole topped with green onions, with a surprise filling of minced smoked salmon. The scones were possibly the weakest part of this afternoon tea. Now don't get me wrong. They were still good, but the other items just overshot the standard. 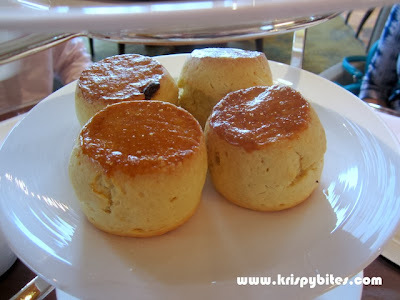 Also I think the scones at Ritz Carlton were better. These ones had crunchy crusts, but the interior wasn't light and fluffy enough. The desserts were the best part, and that's saying something because I usually enjoy the savouries more. Every piece was so delicately crafted with appealing colours and designs. And I really appreciated the fact that none of them were cloyingly sweet. The cassis and yogurt cup had a very strong, tart blackcurrant flavour, but it was balanced out nicely by the creamy yogurt. (Also I'm kind of sad that the picture I took didn't capture the adorable little green chocolate leaves attached to the chocolate stick in the cup.) The daisy cookie was cute, and the lychee mousse underneath was remarkably fragrant and tasty on a crunchy cookie base. In terms of appearance, I thought the small red piece had the prettiest design. A layer of cherry compote lay on a red cookie base, followed by a thin slice of chocolate, then two globs of cherry mousse and a juicy piece of sweet-tart pickled cherry. The hazelnut chocolate bar was perhaps the least exciting for me, because it tasted similar to what I had expected. It was still really good though, and I enjoyed the crispy biscuit base, as well as the creamy chocolate and hazelnut praline on top. And notice the gold flake! Definitely adds a bit of colour to an otherwise dull piece. Halfway through the meal, the servers brought out complimentary snacks for everyone. 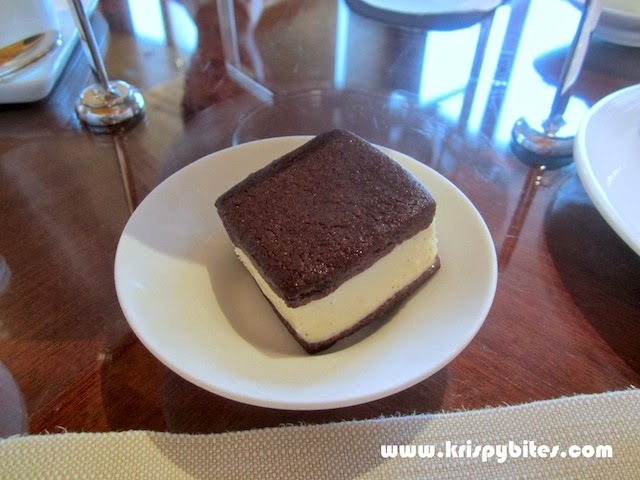 It was a decent-sized ice cream sandwich, with real vanilla bean ice cream between two soft layers of brownie. I heard the kitchen switches it around and gives out different snacks on different days though. In any case, it was a nice gesture and definitely a first for me; none of the other afternoon tea places I've been to offered something like this. 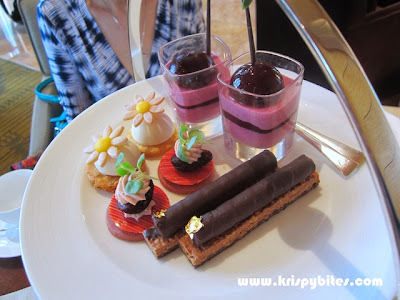 Without a doubt, Four Seasons in Hong Kong is my favourite afternoon tea place to date. And I don't imagine there will be any contenders in the near future. 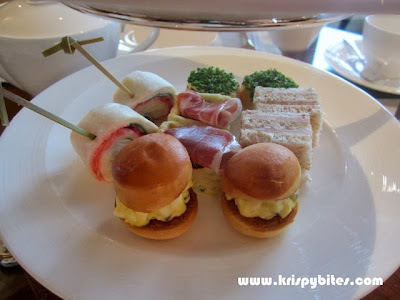 That's one other thing I regret not doing in HK, well, I couldn't afford to do when working in HK lol, was to try high tea at one of the world class hotels. Next time when I'm a tourist! You must must must try this. Worth every dollar. This is on my to-do list for my next HK visit.